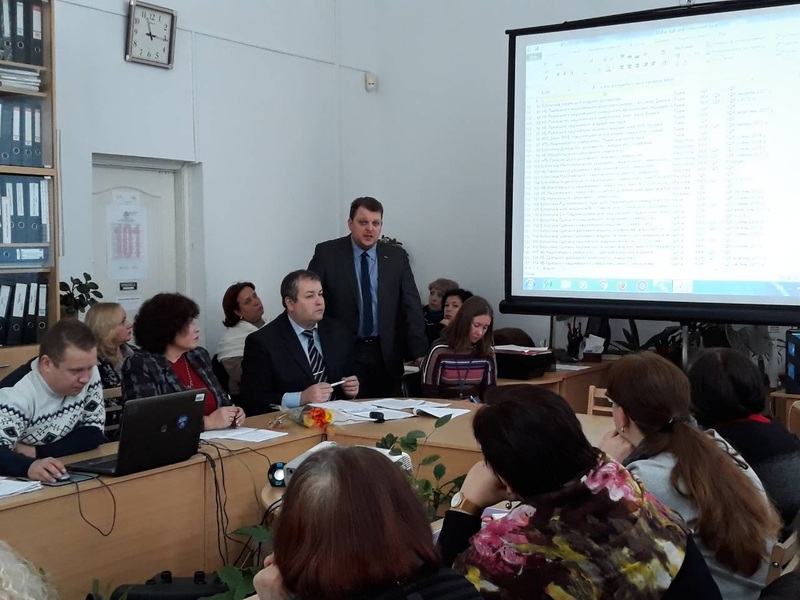 In pursuance of the order of the State Archival Service of Ukraine dated 16.07.2018 № 22/1 «On research exploitation of the electronic document circulation system «ASKOD», the URIAARK took part in the first training for records managers who will use the system of electronic document circulation «ASKOD». 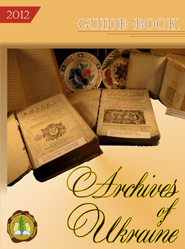 The event took place at the Central State Electronic Archives of Ukraine. At the invitation of the State Archival Service, Director of the URIAARK O. Garanin took part in the meeting of the Collegium of the State Archival Service of Ukraine held in the conference hall of the complex of buildings of the central state archival institutions of Ukraine (Kyiv, Solomyanska St., 24). Director of the URIAARK O. Garanin took part in the second meeting on the issues of reforming the scientific and practical journal «Archives of Ukraine». Among the participants of the meeting were employees of archival institutions, representing the legal and accounting services of their organizations, the authorized person on prevention and detection of corruption in archival institutions. The participants of the meeting defined the practical ways of the existence of the profile journal due to the changes in the regulatory and legal framework of Ukraine. O. Zahoretska, the leading researcher, the department of records keeping of the URIAARK, took part in the meeting of the Central Expert-Verification Commission of the State Archival Service of Ukraine. Director of the URIAARK O. Garanin participated in the first meeting on the issues of reforming the scientific and practical journal «Archives of Ukraine». The meeting was attended by the Head of the State Archives Service of Ukraine T. Baranova, Deputy Head of the State Archival Service of Ukraine I. Bondarchuk, Director of the State Center for the Preservation of NAH Documents G. Wengel, Head of the Association of Archivists of Ukraine M. Shcherbak, editor of the scientific and practical journal «Archives of Ukraine» V. Yanishevsky. The participants of the meeting determined the direction of further development of the profile journal due to changes in the legal and regulatory framework of Ukraine. Director of the URIAARK O. Garanin in order to implement the statutory tasks of the URIAARK, held a working meeting with the Head of the Specialized Academic Council K 27.053.02, the Head of the Department for Records Keeping at the State Higher Educational Institution «Gregory Skovoroda State Pedagogical University of Pereyaslav-Khmelnytsk», DSc (History), Assoc. Professor I. Demuz. The parties discussed the ways for restoring the work of the Specialized Academic Council under the URIAARK, the possibility for defending the candidates’ theses, prepared by applicants and postgraduates of the URIAARK, and the issue of signing a cooperation agreement between the Department for Records Keeping and the URIAARK. Director of the URIAARK O. Garanin participated in solemn opening of a unique exhibition «Kyiv motives. Addresses and Addressees» of the original postcards of the end of the nineteenth – the first third of the twentieth century. The exhibition was organized by the Central State Archives-Museum of Literature and Arts of Ukraine and the Vyshhorod Historical and Cultural Reserve in the premises of the Archives-Museum (Sofia Kyivska). The meeting of the URIAARK Academic Council made changes in the structure of the Council, summed up the results of the thematic research plan implementation by the structural units of the URIAARK at the expense of the state budget in the 2nd quarter of 2018, approved and recommended for printing the first issue of Bulletin of the Branch Center for Scientific and Technical Information on Archival Affairs and Records Keeping in 2018, approved the plan for the Academic Council for the 2nd half of 2018 and requirements for the participants of the competition for vacant scientific positions at the URIAARK; and other current issues of the Institute’s work. Director of the URIAARK O. Garanin and Head of the Department for records keeping of the URIAARK V. Boiko took part in meeting to discuss Methodology for preparing reports electronic forms by archival institutions worked out by the Central State Electronic Archives of Ukraine and the URIAARK due to the order of the Head of the State Archival Service T. Baranova. The meeting was held under the chairmanship of O. Denysenko, Deputy Head of the Department for Interaction with State Authorities and Information and Analytical Support of the State Archival Service, in the presence of Y. Kovtaniuk, Director of the Central Electric Archives of Ukraine, heads and responsible employees of the structural subdivisions of the State Archival Service. Venue: conference hall of the complex of buildings of the Central State Archives of Ukraine (Kyiv, Solomyanska St., 24). In the framework of the work of the International Round Table «Informatization Issues: Digitalization Processes (Theory and Practice)» held at Faculty of History, Karazin National University of Kharkiv and the Central State Scientific and Technical Archives of Ukraine, Director of the URIAARK O. Garanin spoke on «The place and the role of the Ukrainian Research Institute for Archival Affairs and Records Keeping in the implementation of the first priority the State Archival Service in 2018: digitalization of all processes of archival affairs and record keeping», moderated the meeting «Archival scientific and technical documentation in the digital age», and as the Executive Head of the Association of Archivists of Ukraine held the meeting with the intellectuals of Kharkiv. The round table programme envisaged three working days (June 21–23, 2018). The URIAARK was one of the co-organizers of the event. 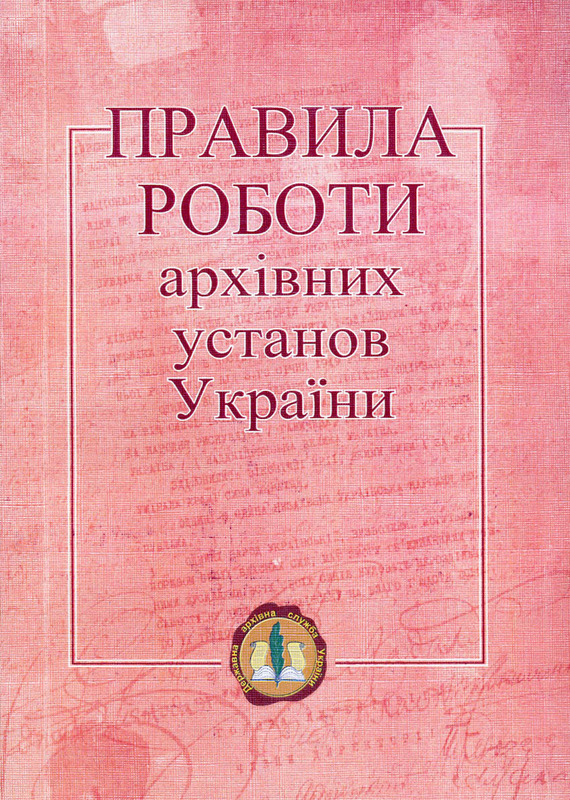 Director of the URIAARK O. Garanin participated in the Collegium of the Central State Archives-Museum of Literature and Art of Ukraine as its member. Director of the URIAARK O. Garanin, as Executive Director of the Association of Archivists of Ukraine, took part in the opening of the documentary exhibition of the Central State Archives of Foreign Ukrainian Studies «My Life – in the Life of My People. The Artistic Roads of Pavlo Maskalyk». 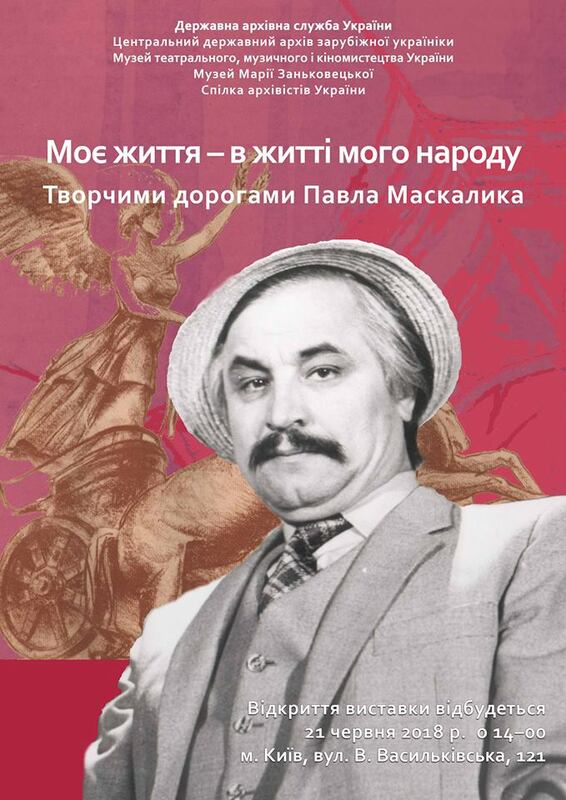 The event dedicated to Pavlo Maskalyk’s 76th anniversary – a multidimensional personality, an actor of the Ukrainian folk theater of Prešov (Slovakia), a writer, a poet, a publicist, and an active public figure. The URIAARK hold the meeting. On agenda were discussed the following issues: administrative personnel rotations at the Institute; complying the science legislation requirements; preparing a new collective agreement; eliminating the shortcomings detected during non-scheduled internal audit at the URIAARK by the State Archives of Ukraine in March 5 – May 4, 2018; organizing the labor protection, fire safety, and civil protection; activating the scientific and technical information service; planning and organizing activities related to the celebration of the 25th anniversary of the Institute in 2019. Director of the URIAARK O. Garanin took part in the meeting of the scientific-publishing commission of the State Archival Service of Ukraine as a member of this advisory body. Deputy Director of the URIAARK N. Khrystova took part in the meeting of the central expert-verification commission of the State Archives of Ukraine as a member of this advisory body. Director of the URIAARK O. Garanin and Deputy Director N. Khrystova took part in the meeting the normative-methodical commission of the State Archival Service of Ukraine as members of this advisory body.. Passed away Andrievs’ka Larysa Victorivna, the Academic Secretary of the Ukrainian Research Institute of Archival Affairs and Records Keeping. Director of the URIAARK O. Garanin took part in the literary and artistic fest «Spring in Pliuty» devoted to the 100th anniversary of the creation of a system of archival institutions of Ukraine, which took place at the Centre for «Literary and Artistic Pliuty», the Central State Archives-Museum of Literature and Art of Ukraine. A workshop of the URIAARK administration and research advisors of the scientific works held at the URIAARK in 2018 discussed the current state of research implementation. In particular, it emphasized the importance of timely research implementation in accordance with the technical tasks and calendar plans and the effective establishment of cooperation with research orderers and archives institutions. 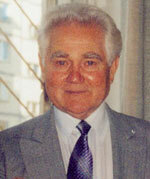 Passed away on the 81st year Katrenko Andriy Mykolaiovych, Doctor of Historical Sciences, Professor and former research fellow at the Ukrainian Research Institute of Archival Affairs and Records Keeping. The URIAARK signed the agreement with the National Aviation University to conduct the practice of students on speciality 029 «Information, Library and Archival Affairs» due to the educational-professional program «Documents study and information activity». Director of the Ukrainian Research Institute of Archival Affairs and Records Keeping О. Garanin, Director of the Central State Electronic Archives of Ukraine Yu. Kovtaniuk, and Head of the department for ensuring records safety and stocktaking, the Central State Electronic Archives of Ukraine Yu. Cherniatynska participated in the scientific-practical seminar with international participation «Providing the electronic document circulation at educational institutions and state authorities», held at the conference hall of the Presidium of the National Academy of Pedagogical Sciences of Ukraine (Kyiv, Sichovykh Striltsiv Str., 52-A). 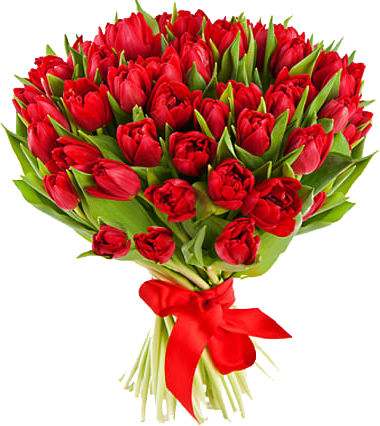 The URIAARK sincerely congratulate the former Director of the Institute Maga Irina Mykolayivna on her anniversary! We wish our Jubilee creative energy, vitality and good health. We wish happiness, goodness, peace, tirelessness in her everyday activities at the responsible post as a Director of the Central State Archives of Foreign Ukrainian Studies. We are grateful to Iryna Mykolayivna for many years contribution of her life, health and scientific support in the development of the science in general and the Ukrainian Research Institute of Archival Affairs and Records Keeping in particular. With great respect, thank you for participating in the joint venture! The meeting of the normative-methodical commission of the State Archival Service of Ukraine considered and approved all project documents prepared the Ukrainian Research Institute of Archival Affairs and Records Keeping. Deputy Director of the URIAARK N. Khrystova as a member of the scientific-expert councils of the State Archival Service of Ukraine participated in a joint meeting of the public and scientific-expert councils at the SAS and commented on the issues of the agenda. The URIAARK participated in the XVI International Conference of Students, Postgraduates and Young Scientists «Shevchenkivs’ka Vesna – 2018» (Section «History», subsection «Archival studies, source studies, historiography, special historical disciplines and methodology of history»), held by the faculty of history, Taras Shevchenko National University of Kyiv, the Council of Young Scientists of the Faculty of History, the Scientific Society of Students of the Faculty of History. Director of the URIAARK O. Garanin participated in the enlarged meeting of the Collegium of the Central State Archives of Foreign Ukrainian Studies. The Ukrainian Research Institute of Archival Affairs and Records Keeping together with the State Archives of Kyiv Oblast co-organized the International Symposium «Humanitarian Discourse of the Multicultural World: Science, Education and Communication», which solemnly started its work at the premises of the National Aviation University. Director of the URIAARK O. Garanin and Head of the Scientific-Technical Information Sector of the URIAARK R. Romanovsky took part in the 2nd meeting of the Interdepartmental Commission on the Introduction of the Universal Decimal Classification (UDC) in Ukraine. The meeting decided on membership of O. Garanin, Director of theURIAARK in the Commission. The URIAARK held the seminar on the quality of educational standards in the scope of archival affairs. The Ukrainian Research Institute for Archival Affairs and Documentation express their deepest sympathy to the leading scientist of the Institute, Zahoretska Olena, about the untimely death of her husband, Vegenko Andriy. Director of the URIAARK O. Garanin and Rector of Bogdan Khmelnytsky Cherkassy National University O. Cherevko signed an agreement on cooperation between the URIAARK and the ChNU. The purpose of the Agreement is to promote further development of science and education, taking into account the achievements of leading domestic and foreign scientific schools. Is being prepared for publication next issue of the scientific annual «Studies on Archival Affairs and Records Keeping» and archeographic annual «Pam’yatky». We accept for publication original, not previously published articles. Materials please post to Solom’yanska Str., 24, Kyiv City, 03110, the Ukrainian Research Institute of Archival Affairs and Records Keeping, and e-mail: studii-pamjatky@arch.gov.ua. Tel. : (044) 275 53 82, Garanin Oleksandr Yakovych. In preparing the articles please observe the following requirements. Appraisal of Administrative Documents: History, Theory, Methodology. 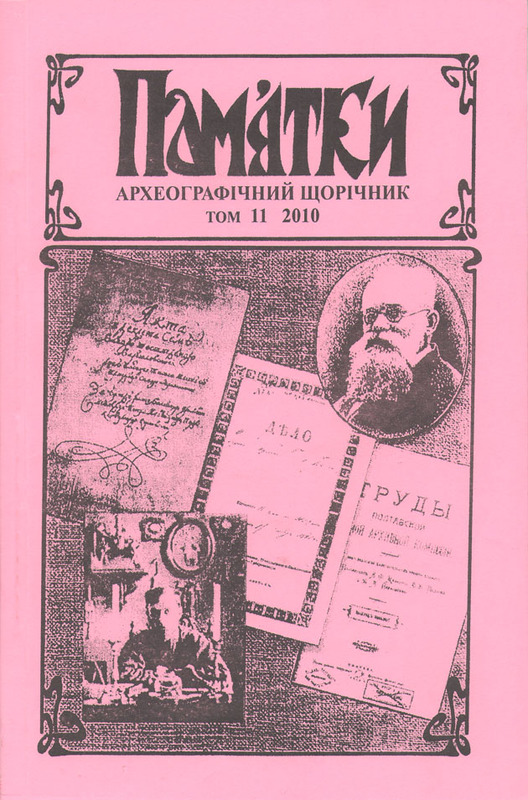 Scientific-methodological manual / S. V. Sel’chenkova, K. Т. Seliverstova; the State Archival Service of Ukraine, the URIAARK. – Kyiv; Rivne, 2011. – 170 p.
Information for students, post-graduates and professionals! S. G. Kuleshov. General Records Keeping: tutorial / the State Archival Service of Ukraine; the URIAARK. 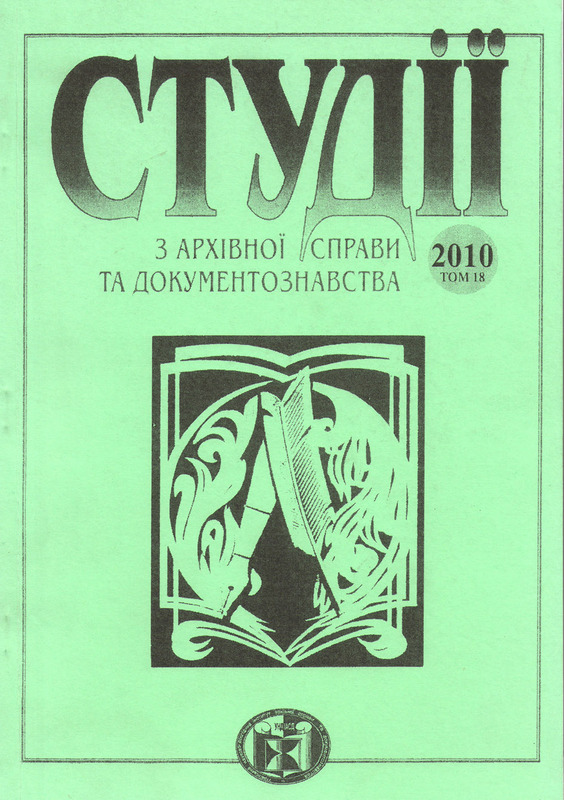 – Kyiv: Publishing House «Kyiv-Mohyla Academy», 2012. – 123 p.